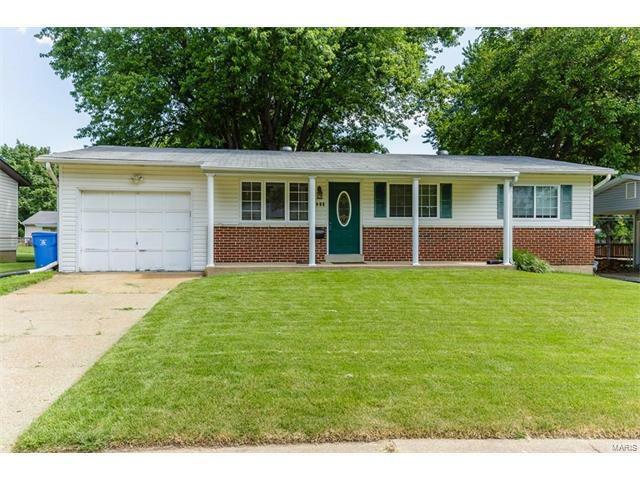 1985 David Drive Florissant, MO. | MLS# 15043747 | Homes for Sale in St Charles, St Louis, Lincoln and Warren Counties! Looking for a Free Foreclosure List? Call Cheri Peterson 314-283-7251 Our Team is on the Leading Edge when it comes to Technology! Cute as a Whistle and Economically Affordable. This Updated Home features Wood Floors in the Living Room & Bedrooms, Spacious Eat In Kitchen w/Gas Stove, Black & White Checked Floors w/Newer White Kitchen Cabinets, Plenty of Counter Space, Dishwasher, Pantry, Newer Counter Tops, Updated Lighting. Kitchen Opens to the Living Room to gave a more Spacious Feel to the room. The Master Bedroom Suite features a Full Bath w/Pedestal Sink & Tiled Floors. The Hall Bath features a Newer Sink & Vanity & Tiled Floors. The Home has Vinyl Siding, Enclosed Soffits & Fascia. Newer Windows, Fenced Yard & Patio. This Home is being Sold in its present as is condition.Seller to make No warranties and provide No inspections. Special Sales Contract to be Used. Subject to Lien Holder Approval. Must have a pre-approval letter with all offers. Place this Home on your Most wanted List!!! !